On Saturday I had to take the girls trainer shopping. It was really only Bart who needed new footwear, but AJ came along too. After much humming and ahhing, in the second shop my three-year old fashionista finally settled on a pair of white (white?!!) 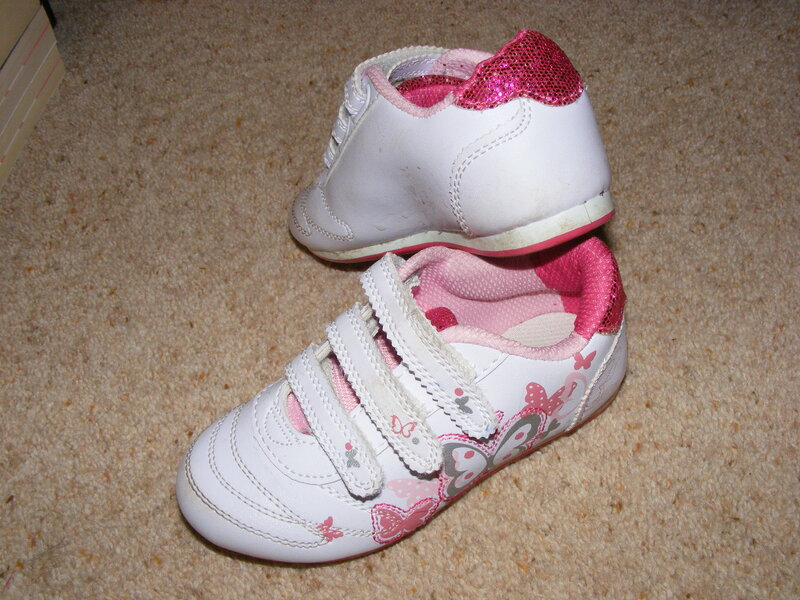 three strap velcro trainers, with pink and coral butterflies along the side and cerise sparkles on the tongue and heel. (“Look at the sparkles Mummy, aren’t they dorgeous?”) They were indeed dorgeous gorgeous and at a penny under £10, the price was pretty good too. Heading back towards the car I could feel AJ herding me like a wayward sheep back towards the first shoe shop we had visited. 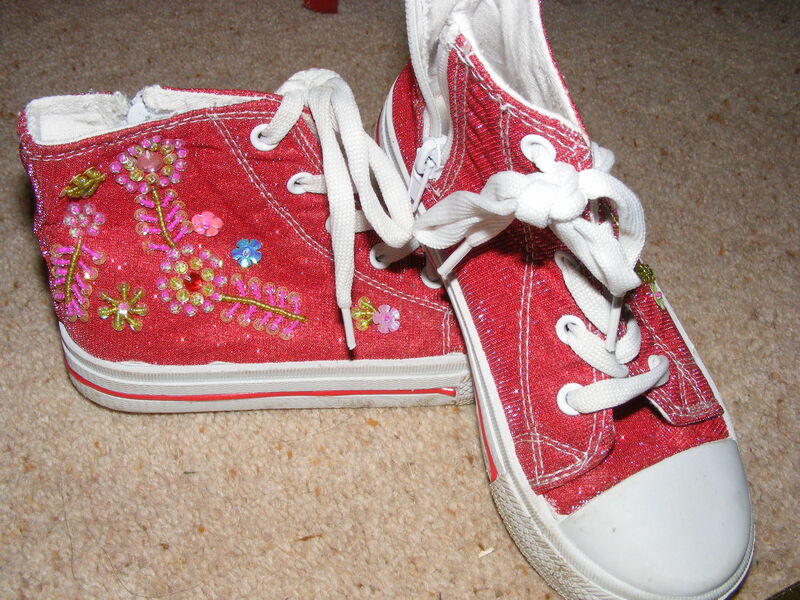 While I had been busy looking at trainers for Bart, she had spotted a pair of sparkly red and floral baseball boots that she really, really liked. When I reluctantly went back into the store to view the boots I had to admit they were cute, something I would have loved to wear at her age. (Heck, I would wear them now if they came in my size.) And they were red! I loved red shoes as a girl. I still remember being about nine years old and saving my pocket and birthday money to buy a pair of patent red leather mary janes which clonked when I walked – like a real grown up. I too could not resist the baseball boots and so my older daughter came home with new shoes too. So we did our usual morning routine. Drop AJ off at the bus, hang around for a while, then head to playgroup. On arriving at playgroup we spotted AJ’s class heading out to the field for their sports lesson and I noticed my daughter was wearing her school trousers. I caught her teacher who was heading back into the classroom and asked her why. “AJ… GET BACK IN HERE!” My sheepish daughter came back into the school where I helped her remove her school trousers and muddy baseball boots, then change into the correct sports attire before sending her back out again.